If you've seen me make popcorn, you know that I already do something akin to this. I didn't own a spare bowl I could drill holes into. It's too bad that such a bowl-with-holes device doesn't already exist. 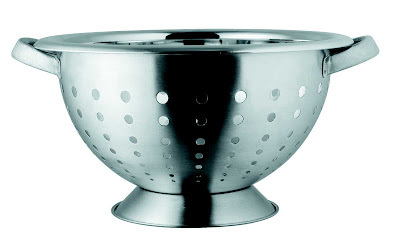 I just have to make do with a colander. And because I do not own any vibrating marital aids, I have to manually shake the bowl, with my hands, like a SAVAGE. On the upside, my popcorn doesn't taste so much like Astroglide. Now, I'm not exactly sure how to take this. I mean, CLEARLY this is a joke. His channel is called Stupid Inventions, right? But he's just so sincere in his comments... surely that's just got to be more of the joke, yeah?